Price: £2.99 (incl VAT) Sorry, this item is currently unavailable. Click here to receive notification when this product comes back into stock. This rich, creamy conditioner incorporates the combined natural properties of both Tea Tree oil and Neem oil and is natural and effective in enhancing the detection of head lice and their eggs. The gentle formulation can be used regularly and is kind to hair and scalp. Use initially with the fine toothed comb and then continue regular use as part of normal hair care routine. Numark Tea Tree and Neem oil conditioner will help prevent further head lice infestations whilst leaving hair soft, shiny and manageable. 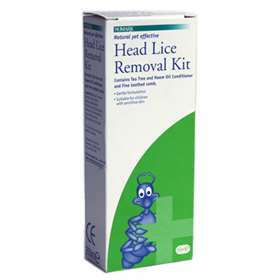 When infestation is first detected use the wet combing technique, as this is the most effective way to remove head lice and nits. After shampooing apply enough conditioner to cover all the hair thoroughly. Comb the conditioner through with a normal comb to remove any tangles and leave for 3 - 5 minutes. To use the fine toothed comb provided effectively, start as close to the root of the hair as possible, with the teeth of the comb touching the scalp and gently work the comb through to the tip of the hair. Clean the comb after each stroke. Work around the head until all of the hair has been combed through and no more eggs or lice are detected on the comb. Rinse the conditioner from the hair with warm water and dry as required. Product code: 3090313 Price: £2.99 (incl VAT) Sorry, this item is currently unavailable. Click here to receive notification when this product comes back into stock.